It's not just about retro styling: the Sigma offers plenty of 'vintage' warmth too. Ribbon mics are the new 'must have' for anyone with more than a basic mic collection, not least because of their smooth tonality and the sense of richness they impart to whatever you point them at, especially guitar amplifiers. They can be used for anything from vocal recording to drum overheads, though you have to be conscious of their figure-of-eight pickup pattern, which means they're just as sensitive at the back as they are at the front. Traditionally, though, good ribbon mics have been expensive, and prone to mechanical failure if mistreated. Their design means that they have an inherently very low impedance, and a low-level output, which requires a good preamp to bring the signal up to a workable level. Providing the source sound is nearby and reasonably loud, most modern preamps offer enough gain to work with ribbon mics, but in less optimal situations it can still be a struggle to achieve enough gain, and with high preamp-gain settings comes the propensity for added circuit noise. 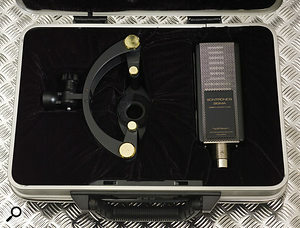 Sontronics suggest that the Sigma was inspired by the vocal legends of the swing era, and while this certainly applies to the mic's physical styling and warm sonic character, it builds on the classic ribbon design by incorporating a specially optimised preamp in the mic body, which is powered by conventional phantom power, much as with a capacitor microphone. At the heart of the Sigma is a two-micron aluminium ribbon, suspended in the field of a permanent magnet. The phantom power drives the on-board electronics, which utilise solid-state output balancing to eliminate the need for a transformer. According to the manufacturers, the Sigma is designed to work well in most applications, including broadcast speech, vocals, and miking guitar cabinets, acoustic guitar, drums and percussion, piano and orchestral instruments. In a classical context, ribbon mics are particularly valued for recording strings, as they produce a more comfortable, smooth high end than many capacitor mics in this application. Ribbons also work well as drum overheads, making cymbals sound less abrasive. The Sigma comes in a lined aluminium case, with a custom-designed shockmount that cradles the mic, via two resilient bushes that isolate the outer frame from the inner mount. A knurled, threaded wheel screws to the base of the mic, ensuring complete security in both normal and inverted configurations. 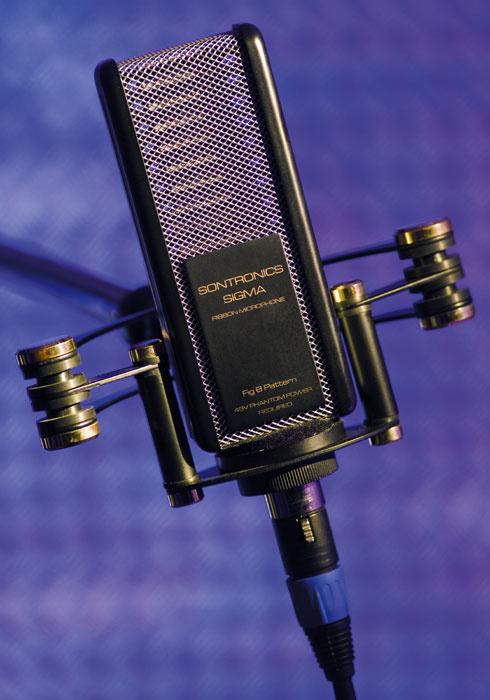 There's no denying the retro styling of both the mic and the Sontronics logo. The sides of the body are made from black-coated, pressed metal, and the majority of the rest is covered in a silver, acoustically transparent metal grille. A threaded neck at the bottom of the mic mates with the threaded section on the shockmount and also houses the balanced XLR output. The ribbon element is clearly visible through the screen. 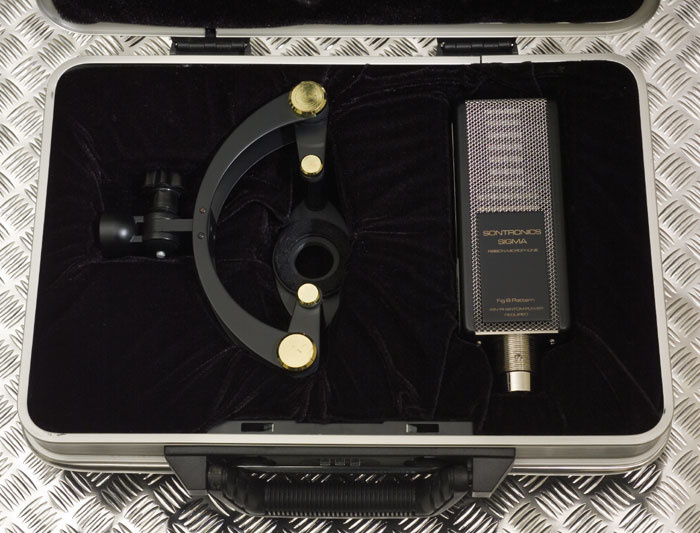 The Sigma is supplied as standard in a smart metal case, complete with its unusually shaped shockmount. Though this type of transducer inevitably has a very low electrical output, the on-board, low-noise, active circuitry brings this up to a level similar to that you'd expect from a capacitor mic, with a quoted sensitivity of 12mV/Pa -38dB ±1dB (0dB = 1V/Pa 1000Hz). The equivalent noise is 14dB (A-weighted), again comparable with a typical mid-priced capacitor microphone, but the frequency response stays faithful to the ribbon heritage, rolling off very gently above 3kHz or so to produce an overall 20Hz to 15kHz response. Judging by the supplied graph, this appears to be around 10dB down at 15kHz and perhaps 16 to 18dB down at 20kHz. Oddly, this rolled-off high end, which is typical of most ribbon mics, doesn't make the top end sound dull, as you might expect, but instead makes it sound smooth and musical. Ribbon mics tend to be regarded much like the leading ladies in pre-war movies (likely to faint at the slightest provocation) and it is true that they don't like being thrown around. However, they're not necessarily afraid of high sound pressure levels, and the Sigma is happy up to a hefty 135dB (for 0.5 percent THD at 1000Hz). Its output impedance is 150 Ohms, so it doesn't require any special type of preamp: as long as you can feed it standard 48 Volt phantom power you're in business. The very first thing I noticed after plugging in this microphone was that I could treat it (gain-wise, at any rate) in much the same way as a capacitor microphone. A spoken-word vocal test showed the tonality to be extremely warm and silky. Those with indistinct voices might find it a disadvantage, but where there is harshness that needs to be polished over, this mic is definitely up for it. There seems to be a subtle tonal difference between the front and rear of the microphone, but on voice it is barely noticeable and both sides pour on the warmth like double cream. Having previously enjoyed working with ribbon mics when recording electric guitar, I put the Sigma up in front of a small guitar combo (around six inches away) and played some almost clean parts comprising both partial chords and single notes. The sound direct from the amp into the room sounded a bit on the harsh side to me when I'd dialled in what I felt was the right overall tonal balance, but the Sigma added the necessary fairy dust and produced just the tonality I'd been looking for. The harshness was gone and the tone sounded altogether sweeter but it still had the brightness and definition I wanted. This ability to smooth and 'expensify' the top end is unique to ribbon mics, and I can understand why they are often the first choice for recording bowed strings. What's more, the mic didn't seem to pick up hum from the transformer in the amplifier, which the passive Sontronics ribbon mic did do when used up close, presumably via its output-balancing transformer. This mic also has enough sensitivity to be used on acoustic guitar without any problems. I found that the mic positions that normally worked well with capacitor mics actually captured rather too much bass end, but what I did capture responded extremely well to EQ (which isn't always the case where acoustic guitar is concerned). By applying some cut centred at 200Hz, augmented by some 'zing' boost in the 8kHz region, I got a very nice sound, very quickly and without paying any penalty in terms of noise. Choosing different mic positions, quite predictably, produced different tonal balances, and a position about halfway up the neck seemed to capture a nice balance for strummed chords. If you don't already have a ribbon mic, the Sigma offers a great way to get into that area without the need to deal with the low sensitivity issues associated with most passive models. Its super-warm sound won't suit everything, but for hard or thin vocals that need a good dose of musical cornflour, it looks to be just the ticket. All figure-of-eight mics are prone to popping at close quarters, and they also exhibit the proximity effect, which further boosts the bass end when used at very close range, so a pop shield is essential for vocal work. Despite the need to EQ, I really liked what the Sigma did for acoustic guitar. As for electric guitar, it makes recording a nice amplifier so easy: the subjective result is almost always better than what you hear in the room and, unlike with most dynamic mics, you don't find yourself in the position of having to use processing to put back what the mic has lost in translation. On the whole, I was impressed by the results I achieved using the this microphone, and if you do a lot of electric-guitar recording it could be worth getting one for that task alone. While not as cheap as a run-of-the-mill project studio condenser microphone, the Sigma is very attractively priced for a ribbon model, especially given that it is active and that the price includes a shockmount and case. There are a number of ribbon mics now on the market but fewer of them at this price point, and the sound of the Sigma is pretty distinctive. If you're looking for a ribbon mic, you might want to check out models by SE, MXL and Beyerdynamic, amongst others. Going up the price range, you could consider models by Royer, AEA and Crowley & Tripp. It is worth looking at both passive and active models, but if you opt for a passive one, make sure you have a preamp that will get the best out of it, as you may need to factor that into the price. Affordable, for an active ribbon mic. Low noise with a sensibly high output level. The rolled-off high end may make the mic too syrupy for some applications, though it responds well to EQ. Though not suitable for every application, the Sigma is hard to beat for guitar-amp recording or for situations where you need warmth and smoothness.